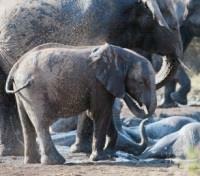 Explore the Madikwe Game Reserve, a safari lodge that puts families first. Track the Big Five and other beasts on guided game drives. Visit the Cape Point Peninsula and spot African penguins waddling along the beach. Discover the wonders of Cape Town and the Cape Winelands together with the kids. 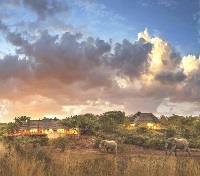 Stay at a handpicked selection of premium family-friendly accommodations and safari lodges. If you asked any child to imagine their dream destination, they’d probably end up describing South Africa. A busy, bustling city with plenty to see and do with a great big mountain right in the middle? Check. 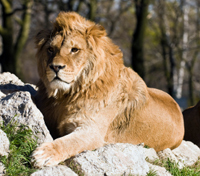 Up-close access to lions, elephants, and other zoo animals, without the zoo? Check. 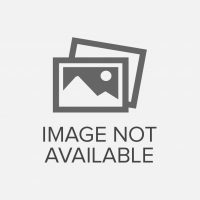 The chance to make new friends far away from home? Check and mate. Building an adventure that gives every member of the family exactly what they want can be a difficult task. South Africa makes it as easy as (bobotie) pie. Experience the comfort of independent, luxury apartment living with the renowned Capetonian hospitality of the exclusive More Quarters property in a quintessential corner of Cape Town. More Quarters boasts luxuriously refined apartments featuring modern and traditional South African furnishings placed elegantly throughout each room ever so settling color scheme and style. 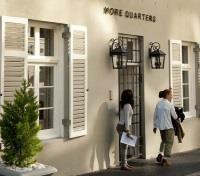 More Quarters is ideally located just off the renowned Kloof Street - which is often referred to as being the "heart of Cape Town." This excellent positioning allows guests to easily explore nearby bars, beaches, great little shops, local eateries and boutiques providing guests with an authentic experience of Capetonian living. 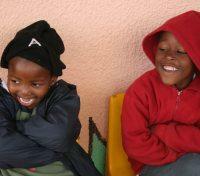 Uthando South Africa is a charity that supports a wide range of highly effective community projects across the country. In an effort to showcase their initiatives and to offer a glimpse into the work being done to uplift disadvantaged communities, Uthando offers daily excursions to visit the sprawling townships around Cape Town where their programs are underway. On this outing, you will visit at least three of the social development projects being funded through Uthando. These visits offer a unique and authentic introduction to the social problems confronting so many South Africans while also illustrating the innovative and inspirational ways in which these issues are being overcome. Importantly, the projects are not treated as tourist attractions and the tours are designed to educate, inform and inspire while also respecting the dignity and privacy of the people affected. The projects are, after all, places where people work and live. At the end of your community experience, you will be dropped off at your hotel. It is worth noting that a portion of your tour price goes directly to Uthando charities. 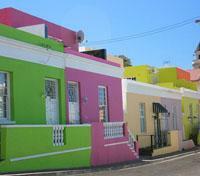 The Cape Peninsula is a complete contrast to cosmopolitan Cape Town. With its wild national parks, artistic bohemian seaside villages and working fishing harbors, this day is focused on embracing the locals and spending as much time out of the vehicle as possible. With your specialist guide, head to your first stop – Cape Town’s coolest coffee at Muizenberg’s Surfers Corner, the epicenter of South Africa’s surf culture. From here it’s off to Kalk Bay to explore the harbor and meet the jovial, often entertaining members of the fishing community. Browse bohemian art shops and perhaps take a short hike through the fairy-like Milkwood forests; the day will be curated to your wishes as it progresses with the help of your guide. Head to Simon’s Town to find our rogue penguins on a secret beach that’s typically only accessible to locals. Weather permitting, you’ll be invited to snorkel or use stand-up paddle-boards to gain a unique perspective of the penguins. After visiting Cape Point, venture deeper into the Peninsula and explore deserted wild beaches, secret coves, rock pools and shipwreck-strewn hiking trails away from the tourist crowds. This part of the Table Mountain National Park is home to ostrich, baboons, tortoises and mountain zebra, so be sure to have your camera ready to capture photos of these often elusive animals. The return journey along the Atlantic coast offers countless lookouts, hidden cafes and watering holes that are chock full of character. You’ll experience this firsthand when you stop for a beer tasting at a local surfer hang-out, the final stop before being returned to your hotel after an active day in the Cape Peninsula. 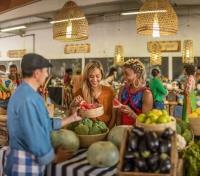 No tour of Cape Town is complete without trying the city's local eats and treats. Today, enjoy a casual lunch option where the food-quality is high and the vibe is relaxed. Cafes, fish & chips, market stalls and artisanal food offerings with seasonal produce are to be expected, served with unpolished but genuine service. Please note: local drinks are included during your lunch experiences however anything over and above the local soft drinks, house wines and beer will be at additional cost. For alternative lunch options, please speak to your Destination Expert to learn more. Bond as a family with the brilliant Cape Winelands as a backdrop on this private and tailor-made outing. Designed to create memories your kids will talk about to for years to come while also providing you with the full Winelands experience, begin the day with a treasure hunt through the scenic Mont Rochelle Nature Reserve, situated in the Franschhoek Mountains. Affording spectacular views over the Franschhoek Valley, the reserve is home to small animals, fynbos and a diversity of plant life. The quest leads to Breakfast Rock (less than a leisurely mile into the reserve) where juice and delicious home-baked treats are served. The next stop is a charming boutique estate renowned for its sparkling wines. From here, the resident winemaker travels to Champagne every year, and - glass of bubbles in hand - it is clear that his time is well spent. While parents enjoy a wine-tasting, kids have their own, specialized iced-tea tasting, never left out for a moment. You will also explore the charming town of Franschhoek with its French Hugenot origins – and will have the option to participate in active hiking and biking which is ideal for older kids. 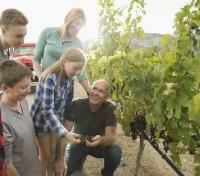 Then it’s on to a family-friendly wine estate where family is at the heart of all things, and where little explorers are not only warmly welcomed but are invited to treat their farms as a playground. This is a world where fountains have been specially designed for cooling off after a run through the vines, and milk and cookie tastings are done in a cellar courtyard. In the afternoon, old wine estate with ancient cobweb-filled cellars reveal their secrets to wine aficionados and young imaginations alike. Taste the flavors and vintages of the region while kids are entertained by ghost stories, play in magical surrounds and wander through charmed gardens. In a place like Cape Town, the surrounding winelands or the Cape Peninsula, nothing beats a picnic. Local flavors and generous portions tailored to your liking are on the highly-personalized menu today; ideal if the weather plays ball and you want to take advantage of the stunning outdoor vistas. Please note: local drinks are included during your lunch experiences however anything over and above the local soft drinks, house wines and beer will be at additional cost. For alternative lunch options, please speak to your Destination Expert to learn more. 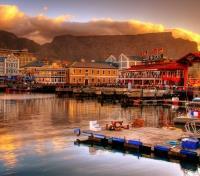 Board a flight in Cape Town with direct service to Johannesburg. Approximately flight time is two hours. Board a scheduled charter flight in Johannesburg with direct service to Madikwe. Approximate flight time is one hour. Please note, strict luggage restrictions apply to this charter flight: 1) Maximum of one soft-shell checked bag, weighing up to 44 lbs (20 kg). 2) Guests can also bring one piece of carry-on luggage with a maximum weight of 11lbs (5kg); carry-on luggage cannot be larger than 24”x16”x12” (60cm x 40cm x 30cm). Guests may also bring one slimline laptop bag. Hard-case luggage will not be permitted on the charter plane. Space for extra luggage can be provided by purchasing an additional seat on the plane (allowing for up to 132 lbs of extra luggage). Tuningi Safari Lodge’s game rangers are highly qualified and have sound knowledge of the fauna and flora within the Madikwe Game Reserve and pass on this knowledge and passion to guests during their morning and afternoon game drives and walking safaris. The team of ultra professional and passionate staff are eager to please and will go to great lengths to ensure you have an outstanding safari experience leaving you with exceptional memories. 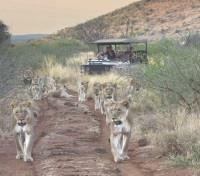 Africa’s big game abounds in the Madikwe Game Reserve. Each day brings something different, as you explore the endless fascination of Africa’s wildlife in an open, state-of-the-art Land Cruiser with a roof for sun protection in the summer months. Whether it is a leopard on the hunt, lions roaring at twilight, dung beetles going about their business, or birds building a nest – all can offer an amazing experience! With all the good food and leisure, why not exert a little energy and take a bush walk with your armed, and highly qualified ranger? There is no better way of getting closer to nature than on foot. You will be awed by the smaller aspects of the bush that are unveiled to you: animal tracks, dung facts, interesting insects, assorted trees, colourful birds and how they all come together in an intrinsic ecological web of life. After an exciting game drive, guests can relax with a sundowner at the bar or soak up the sun next to the rim flow swimming pool, while enjoying even more game viewing at the active waterhole. Tuningi Safari Lodge offers 5-star accommodation in the heart of the Madikwe Game Reserve. This South Africa safari lodge is family friendly and boasts a range of child friendly activities while parents are enjoying their game drives or a romantic dinner. 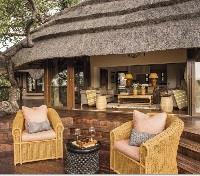 The 5-star villa accommodation features an African-Colonial inspired interior with retractable doors and windows, allowing guests to invite the African bush in. 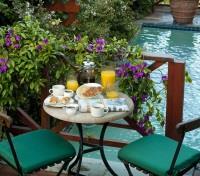 Each villa boasts a luxurious en suite bathroom and air-conditioning. Guests can also make use of Little Tuningi which provides exclusive accommodation for guests seeking privacy. After an exciting game drive, relax with a sundowner at the bar or soak up the sun next to the rim-flow swimming pool. Children can look forward to treasure hunts, special dinners with kid friendly meals, and learning more about the surrounding nature. Often parents have to compromise their family time in favor of an exclusive bush getaway as many luxury lodges do not cater for children. However, Tuningi has launched its kids’ programs to cater for family getaways, which entails a number of ‘firsts’ in bush activities. Children over five years are able to enjoy the usual daily game drives along with experienced rangers, their parents and other guests, while children below five years old are issued with a workbook and taken out on their own, for shorter ‘bumbles’. 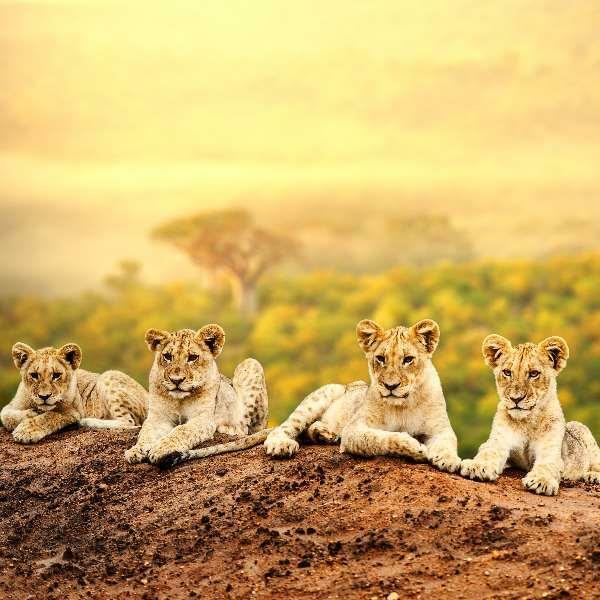 While parents enjoy the early morning game drives, they can be assured that if their children remain behind, they are looked after by the lodge’s professional child minders until they wake, after which they are taken to the main lodge for breakfast. All children under the age of five will be taken on short ‘kiddies bumbles’ after breakfast in the mornings. Older children are issued with an activity book where they can record sightings and animal behavior every day. Lots of toys, lego, coloring books and puzzles are available any time of the day, while the lodge managers host formal activities every day. During afternoon game drives, treasure hunts for children can be arranged and an educational talk on the items found is given by a knowledgeable staff member. In the evenings, children can eat dinner in their room or they can enjoy an interactive dinner with a chef, who allows them to make their own foodie treats. On boma evenings children can make their own bread on sticks, or toast marshmallows on the fire. 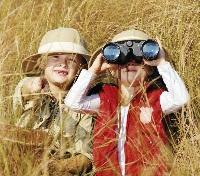 Treasure hunts for natural items collected from the bush such as bones, feathers, nests, eggs, etc. During this afternoon game drive you’ll understand why the Madikwe Game Reserve is a testimony to an enlightened conservation plan which has created an exceptional environment for wildlife to thrive. 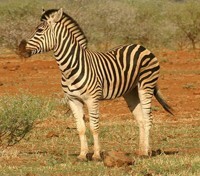 To enter Madikwe is to stand at the very threshold of African wilderness. This is a near-perfect ecological environment where every plant, animal, and insect forms an essential part of an intricate web of survival, the epitome of the phrase “Circle of Life.” Here, life and death are one and a necessity for the continued existence of this naturally occurring phenomenon that has been unchanged in Africa for millions of years. Embark on an early morning game drive with your expert ranger. Madikwe is known for its diverse wildlife species as a result from the effort put forth in the 90's to encourage conservation with a program named "Operation Phoenix". This epic project is to this day one of the largest game translocation exercises ever undertaken in the world. More than 8,000 animals of 28 species have been released into the Madikwe Game Reserve including elephant, rhino, buffalo, lion, cheetah, wild dog, spotted hyena, giraffe, antelope and other various herbivores. You’ll be out on the reserve for a few hours before returning to the lodge before lunch. Board a scheduled charter flight departing from the airstrip near your lodge in the Madikwe Game Reserve with direct service to Johannesburg. Approximate flight time is one hour. Please note, strict luggage restrictions apply to this charter flight: 1) Maximum of one soft-shell checked bag, weighing up to 44 lbs (20 kg). 2) Guests can also bring one piece of carry-on luggage with a maximum weight of 11 lbs (5 kg); carry-on luggage cannot be larger than 24”x16”x12” (60cm x 40cm x 30cm). Guests may also bring one slimline laptop bag. Hard-case luggage will not be permitted on the charter plane. Space for extra luggage can be provided by purchasing an additional seat on the plane (allowing for up to 132 lbs of extra luggage).